A water softening system is a useful thing to have if you have hard water. Whether or not you have hard water depends on the area in which you live, and even people who receive water from city (municipal) sources can be stuck with it. To explain it in simple terms, hard water has a high mineral content. It isn’t harmful to drink, although it can taste unpleasant. The main issue with hard water is the fact that it can clog your pipes, since it leaves behind chemical deposits. It can also stain your sinks, toilet and bathtub. For all of these reasons and more, water softeners were invented. These devices connect to your water supply and filter it, taking away most of the unpleasant minerals. Water softeners can be purchased at many different home improvement stores. Once you purchase one and take it home, if you have some plumbing knowledge, you can install it yourself – otherwise you are better off hiring a professional. Installing a water softening system yourself requires several steps and some plumbing tools. Before you begin, you need to determine where to install the softening device. It should be installed in your basement, at least ten feet away from your hot water heater. Once you know where you want it to go, you next to need to find your water shut off valve and turn off all of the water to your home. After this, you need to drain your water lines, and turn off your hot water heater. The next steps involve connecting the new water lines that will flow into the water softener. 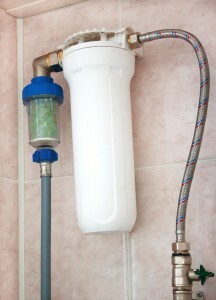 The remote bypass, all of the fittings, the brine line, the drain line and the drain tube all need to be connected. Next, you need to set up the softener and then turn everything back on to test for leaks. If you haven’t found any, then congratulations! You’ve just successfully installed your new water softener.